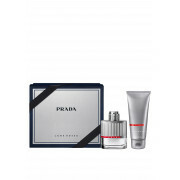 This masculine fragrance by Prada is brilliantly created with inspiration from the natural world and passion for innovation. Created with Dynamic energy this fragrance has notes of lavender, orange, Clary Sage and Spearmint. This gift set comes with Eau De Toilette and Shower Gel.